Mars casino does not only prove that there is life on Mars, but that there’s a well-advertised bitcoin casino somewhere out there. This bitcoin casino features over 1,300 games and is home to about 100,000 players from around the world. Mars casino prides on having better games than some of the best bitcoin casinos, as well as galactic-sized bonuses and excellent customer support. The casino runs on SoftSwiss’ platform and has a license in Curacao. Without further ado, let’s start with the Mars casino review, and see what the Red planet casino has in store for first-time visitors. The Mars casino signup process is swift and without delays. Upon registration, new casino players should provide a valid email address, pick their password, username, and, if available, enter a Mars casino bonus code. At the time of writing this Mars casino review, there were no active bonuses on registration. At Mars.casino, new players are asked to confirm their account via email before they can engage in an epic Martian casino adventure. 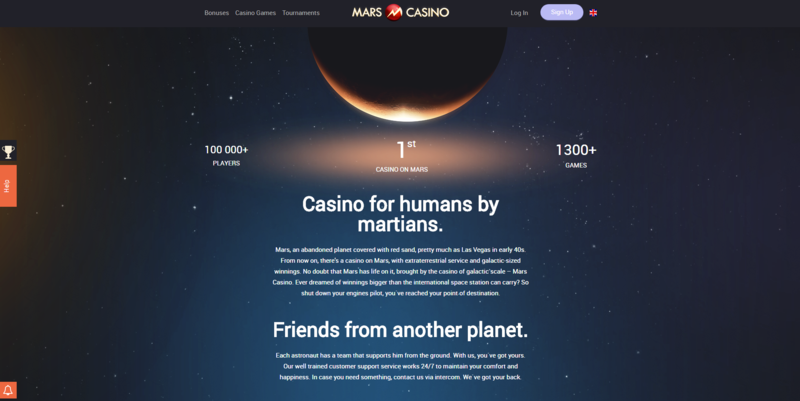 The Martian-themed website is user-friendly, allowing new casino players to quickly navigate through it and access games, bonuses, and tournaments with ease. At the bottom of the homepage, casino players will find the supported payment methods and the casino’s most popular game providers. In the same section, casino users will find quick links to customer support and the website’s FAQ page in case they get stuck at any point. The Mars casino has more than 1300 games (now 1689) Slots total (1176), Roulette (50), Jackpot (60), Bitcoin (656), Video poker (105), Poker games (43) and live games (27) you can see all of them on their homepage. There is also a separate game category featuring various games such as heads and tails, scratch dice, and virtual soccer (62). To help you find your favorite casino games Mars casino features a ‘top games’ section where you’ll find popular titles from the casino’s leading software providers. Blood Suckers, Dr. Jekyll & Mr. Hyde, Book of Aztec, and Book of Pyramids are some of the most popular games at the casino. Mars casino has a ‘feeling lucky’ feature that will pick a random game for you, and there’s also the search bar to help you find the games you’re looking for with exceptional ease. Quickfire is the predominant software provider at Mars casino with the highest number of games on offer including slots and roulette games, as well as titles from in the ‘other games’ section. Amatic and Endorphina offer bitcoin slot games, while Ezugi features live bitcoin games only. The below list holds all the game developers at this casino, along with the number of games they provide. Mars casino has a total of 935 games, but they are inconsistently separated into categories. For example, when you browse through NetEnt’s games, there are 94 NetEnt slots and two live games. On the other hand, when you set all NetEnt games to show, there are 146 casino games. Something doesn’t add up. All games at Mars.casino allow the option of playing for fun. Players can switch to playing for real money at any time as long as they have a positive balance on their account. The casino games support widescreen and full-screen display. Those that have a full-screen icon can be set to 4:3 ratio, while for the games that don’t have display controls within their settings, Mars casino uses widescreen display by default. When it comes to loading times, players can expect any game to open within 10 seconds. Keep in mind, though, that game loading times heavily depend on players’ Internet speed. We ran Google Page Insights tests to see how well the casino’s website performed. The results showed that the casino’s homepage has a PageSpeed score of 40/100 which is below average. The speed of one of the casino’s games we tested, Santa’s Village, was 78 which is a rather good result and the average loading speed for most online bitcoin casinos. Therefore, we can overlook the somewhat slower loading times of the Mars casino homepage as the page features a lot of interactive content. All the games at the Mars casino offer fair gambling guaranteed by the casino’s license from the Government of Curacao. In the effort to create a more comfortable and secure gaming environment, the casino has an informative page about provably fair games, and the information players need to verify if the games in the casino are both fair and random. Additionally, all SoftSwiss games at the casino are provably fair and can be instantly verified using tools within the game itself. Mars casino doesn’t have an app that casino enthusiasts could download for Android or iOS devices. What it does have, however, is a rather good mobile version of the website. When compared to the desktop website, Mars mobile casino shows better optimization results, and the games’ graphics and loading times are good. Supported currencies at the casino include Euro (EUR), American dollar (USD), Australian dollar (AUD), Canadian dollar (CAD), British pound (GBP), Norwegian Krone (NOK), Swedish Krona (SEK), Russian ruble (RUB), Ethereum (ETH), BitcoinCash (BCH), Litecoin (LTC), Dogecoin (DOG), and of course, Bitcoin (BTC). So, regardless if you are looking for some Bitcoin or Ethereum gambling action, Mars casino has you covered. As far as payment methods go, Mars casino accepts major credit/debit cards and eWallets. For making deposits, casino players can use Visa, MasterCard, paysafecard, Maestro, Sofort, Neteller, Skrill, Cubits, and bank transfer. The transaction fees are 2% for all deposit methods except for Cubits (0.5%), Visa (2.5%), and Sofort (1%). The minimum and maximum limits per transaction for all supported deposit methods are €10 and €4,000, respectively. Players can withdraw their winnings via Visa, MasterCard, Sofort, Skrill, Neteller, Cubits, and bank transfer. There are no withdrawal fees, and the minimum and maximum withdrawal limits are the same as the depositing ones. Processing times for deposits and withdrawals are instant for all payment methods available at the casino. Mars casino welcomes new players with bonuses up to €300 and 50 Mars casino free spins with the first, second, and third deposit. 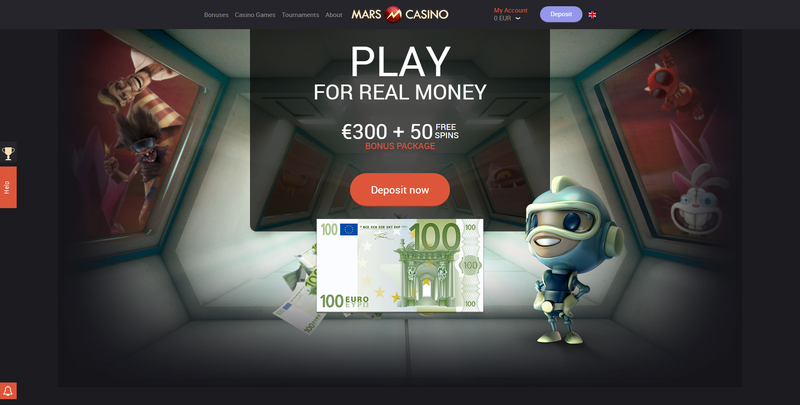 To be eligible for any of the Mars casino deposit bonuses, casino players should first make a deposit of at least €20 and up to €100. With the first deposit bonus, players get 100% match deposit bonus of up to €100 and, if they make a deposit in fiat currencies, they’ll get 50 free spins on NetEnt’s Starburst. Casino players that make a deposit in Bitcoin or come from a country where NetEnt games are restricted will receive 50 free spins on Betsoft slots including True Sheriff, A Night in Paris JP, Event Horizon, After Night Falls, and Mr. Vegas. The second and third deposit bonus are 25% match deposit bonuses. To withdraw any winnings from the deposit bonuses, players should bet the bonus amount 40 times in two weeks upon receiving it. To get the maximum bonus of €300, your first deposit should be €100, and the second and third deposit should be €400 each. This way, you’ll have €1,300 on your account including €1,000 you’ve deposited and €300 from the casino. When it comes to free spin requirements, new players’ accounts will be awarded 25 free spins 23 hours after making the initial deposit, and another 25 the next day. There’s also a 24-hour time frame during which players should activate their free spins bonus. To read about the games that don’t count towards the wagering requirements, and any other information about the welcome bonus package, check out the welcome bonus terms. At Mars casino, players can boost their balance by depositing a minimum €20 on Mondays and Wednesdays. The wagering requirement is 40x, and players have 14 days to meet it; otherwise, the bonus will expire. For Mars casino players that make deposits frequently, there’s a perfect offer on the website. Namely, if they make three deposits within one day that are equal or exceeding €20, they can get 25 free spins with 40x wagering requirement. Once they receive the free spins, players can use them in the following 24 hours. There is a bonus for players that will make four deposits in four consecutive days without requesting a withdrawal. The minimum deposit amount of all four deposits should be €100. The wagering requirement is the same as for all the other bonuses at the casino, i.e., 40x. If all the conditions are met, there’s a 15% cashback for the most loyal casino players. There are certain country restrictions for all the promotions that are running at Mars casino. Players from any of the following countries are not eligible to participate in any of the promotions available at the casino: Albania, Bulgaria, Cyprus, Croatia, Lithuania, Latvia, Macedonia, Romania, Ukraine, Slovenia, Slovakia, and Serbia. At this time, there are no active Mars casino no deposit bonus codes. However, when a new Mars casino no deposit bonus becomes available, make sure to visit the ‘bonuses’ tab in your account and add the latest Mars casino promo code to receive a bonus. The website is offered in two languages, English and Russian, and players from the US, UK, Ukraine, and Spain are restricted from playing at the casino. Moreover, Mars casino doesn’t offer an anonymous gaming environment. After you’ve registered on the site, if you want to make a deposit you need to provide your details first. This includes everything from your place of residence and contact phone to date of birth. The Government of Curacao fully licenses Mars casino, and the casino’s parent company is Direx N.V. Mars casino players can enjoy playing their favorite games, knowing their personal information is protected as the casino employs the latest SSL encryption technologies. Bitcoins are stored in cold and semi-cold wallets to ensure the customers’ funds are safe. There’s only a small amount of funds used for daily transactions that is kept in hot wallets. Mars casino players can contact the website’s customer support via email and live chat. The live chat service is available 24/7, and the chat agents are prompt in answering their clients’ enquiries. Is Mars casino a good choice? We’ll now let you know our final thoughts about this gambling platform as the concluding part of this Mars casino review. Being a fully-licensed bitcoin casino, Mars casino offers players a fun and safe gaming environment. However, if you’re looking for a more anonymous casino or come from the casino’s restricted countries such as the US or UK, then you should continue looking for that perfect bitcoin casino that meets all your expectations.